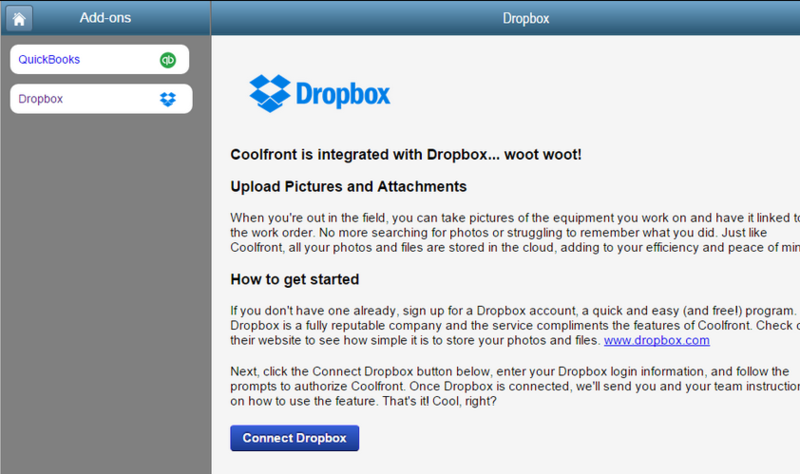 You can now upload pictures and files to your customer's work orders with Coolfront's Dropbox Add-on! Dropbox is a free program to host and share all of your files, pictures, and videos. Like Coolfront, everything is safely stored in the cloud. Plus, there's a free version of Dropbox with 2 GB of storage. If you already have a Dropbox acount, awesome! Now you just have to link it with Coolfront by going to the Add-on section in Coolfront's left navigation and select Connect Dropbox. Only Admin can enable and disable the Dropbox add-on. Once connected, Service Professionals can use Dropbox to attach pictures to work orders. Here's a Coolfront How-To on using Dropbox to attach pictures and files to work orders. Please note: Pictures and files attached to work orders are for internal use only. Homeowners will not be able to view any attachments to their work orders.